Sidechaining might have just got simple. 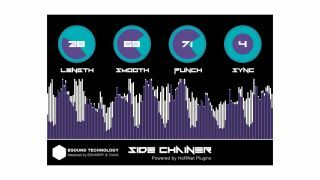 HoRNet has released BSharry Side Chainer, an affordable plugin that enables you to achieve the classic 'pumping effect' heard on countless electronic music releases without any kind of audio routing. Typically, this effect is achieved by using a compressor sidechained to a kick drum, but with Side Chainer, the signal driving the internal compressor is automatically generated and synced to the host tempo at your choice of time division (1/8, 1/8 dot, 1/4, 1/4 dot, 1/2 or 1 bar). The plugin's controls are said to be calibrated so that you always get a useful effect out of it, and are designed to modify the time and shape of the internal control signal. Side Chainer's interface shows you two visual representations of the audio - the original and the modulated result - so that you can see the pumping effect in action. BSharry Side Chainer is available now from the HoRNet website priced at €8.99. A demo is also available, and VST, AU and RTAS formats are supported.